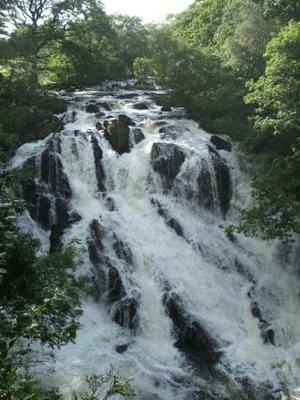 Probably the most photographed waterfall in the Snowdonia National Park of North Wales, Swallow Falls has been a popular tourist spot for over a hundred years. 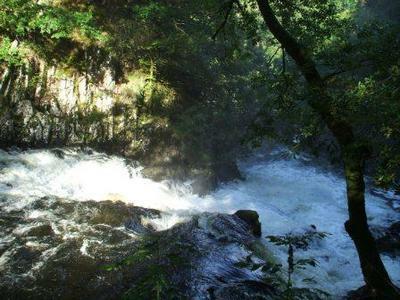 The Afon Llugwy river has carved its way through the Gwydyr Forest and tumbles over the boulders in three tiers to create Swallow Falls or Rhaeadr Ewynnol as it is called in Welsh. 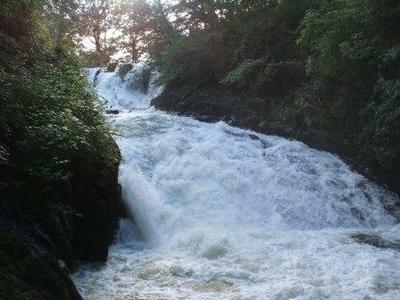 In 1913 the falls were given to the village of Betws-y-coed by Lord Ancaster the local land owner. As the local council was in debt due to improvement works in the village they decided they could make some money from this popular attraction by charging an entrance fee. This proved very successful and you still have to pay to view the falls from the south bank. 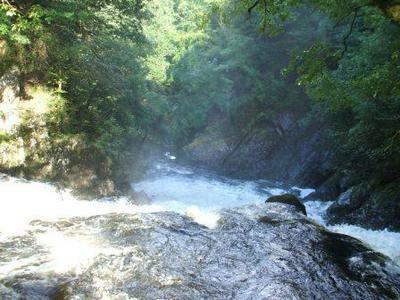 The falls are situated on the main A5 road 2 miles north of the village of Betws-y-Coed. There is plenty of parking in a large lay-by or in the hotel car park opposite. Concrete viewing platforms have been built at different levels allowing close access to the water. However if you wish to view the falls for free it is possible to walk from the village on a challenging if not dramatic path through the gorge on the northern bank.